Two suspects have been arrested over an August 22 rocket attack from Lebanon on northern Israel. Two suspects have been arrested over the recent rocket attack from Lebanese territory into Israel, the Lebanese Army said Saturday. In a statement quoted by the Lebanese-based Daily Star, the Army said the two suspects - Youssef Mohammad Fliti and Omar Abdel-Mawla al-Atrash – confessed they had supplied the four rockets used in the August 22 rocket attack on Israel. According to the statement, Fliti and Atrash confessed they had transferred the rockets from the West Bekka district and delivered them to a man in Tyre. Four wooden launching pads were discovered earlier this month on the outskirts of Hosh village in Tyre, reported the Daily Star. The Army said the suspects were referred to the judiciary and that efforts are under way to detain others involved in the incident. 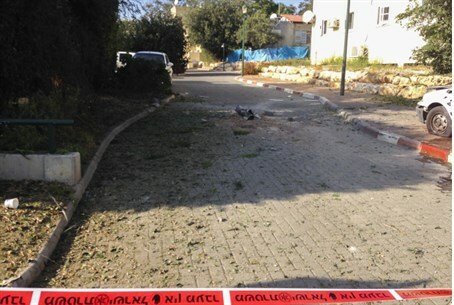 At least one of the four rockets fired in the attack in question struck in the area of Nahariya. One rocket was intercepted by the Iron Dome missile defense system, between Akko and Nahariya. Three others struck in "open areas." The attack was claimed by the Abdullah Azzam Brigades, an Al-Qaeda-linked terror group which had claimed similar rocket fire on Israel in 2009 and 2011. Hours after the attack, Israeli aircraft struck a terror target south of Beirut. The Lebanese Al-Manar television network, identified with Hezbollah, identified the site attacked by Israel as a base of the Popular Front for the Liberation of Palestine-General Command in the southern Lebanese community of Nu'eimah. Lebanon’s president Michel Sleiman condemned the rocket fire from southern Lebanon, saying it was a violation of UNSCR 1701, which brought an end to the Second Lebanon War in 2006, and to Lebanon's sovereignty.